Once you have a look at these homey desserts, including old-fashioned puddings, bread puddings, custards and more, you won't be able to whip up one fast enough. 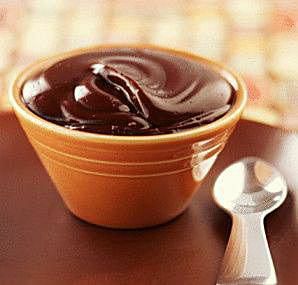 This chocolate pudding has a marvelous deep, rich flavor and ultra-smooth, creamy texture. Plus it's super-quick to make. You can serve it warm - for those who just can't wait to dig in to its chocolaty goodness - or well chilled. It's also fabulous served with a thin layer of cream poured over the top or a spoonful of softly whipped cream - or, just a tall glass of cold milk. These individual cakes with molten chocolate centers are popular on American restaurant menus. This version is especially rich and chocolaty and would be made even better with a scoop of vanilla ice cream. Soft, creamy, and soothing, rice pudding is a dessert you never outgrow. Baked rice puddings tend to be firmer than the stove-top variety and have a more custard texture. A topping of cinnamon sugar is sprinkled over the pudding before it bakes, leaving a slightly crunchy crust. I like to use long-grain rice for the pudding, as it's less starchy than short or medium-grain rice, and the pudding isn't as heavy—just absolutely delicious! Nothing says comfort more than this banana bread pudding. Created as a way to use up stale bread, this decadent dessert has it all ― a creamy, warm, custardy texture filled with banana and raisins. Top with a dollop of freshly whipped cream to make a good thing even better. Valentine Desserts -- Better Than a Date!